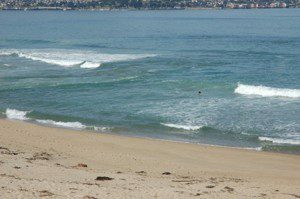 The so-called rip current is a water flow that occurs perpendicularly to the sea shore and flows out into the sea with more force than usually has a swimmer. They are located outflow corridors of accumulated water on the shore through channels. 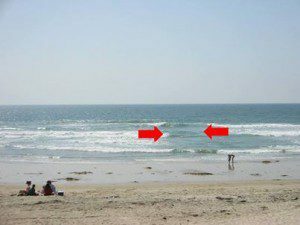 The rip current, depending on the size of the opening, has a length of between 20 and 200 meters and a width of between 3 and 7 meters; a catapult that launches the bather without warning, but which doesn´t have to be fatal if you can swim and act calmly. A long water pipeline with turbulence and different waves than in the environment; a body of water with a different colour (bright or darker blue, floating sand or white foam); objects floating offshore; changes in wave lines; or eroded sand banks and visible at low tide. Swimmers caught in the current attempt to swim towards the beach, often against the current, they become exhausted in the attempt and they panic. Once inside the current, most important is not to panic and let go because the current will stop dragging sooner or later: They are also known as return current flows because they describe circular orbits, i.e. once outside its influence you can easily return by either side of the current. – Do not fight the current. – Escape the current by swimming parallel to the shore. When out of the current, swim diagonally away from it and towards the shore. – If you don´t manage to escape swimming, staying afloat will always be the priority, until the current stops dragging you offshore (this distance is rarely more than 50 meters). – When the current has dissipated, then you have to swim diagonally away from it and towards the shore. – If at any time you feel you cannot reach the shore, you should ask for help shouting or waving your arms. 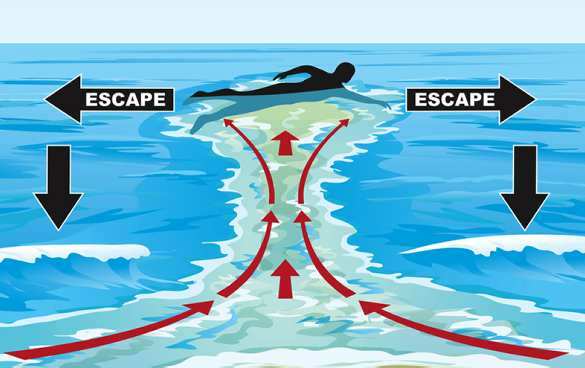 How to help someone who is caught in the rip current? – Unless you are a lifeguard, don´t try. Ask one for help. Doing so may mean that you become a victim yourself. Many people died in their rescue attempts. – If there is no lifeguard call emergency services (112 free) and ask for help. – Then indicate the victim how to escape by shouting or making signs. – If possible, throw a floater. Thanks Hugh, have a nice swim and be careful with those rip currents!